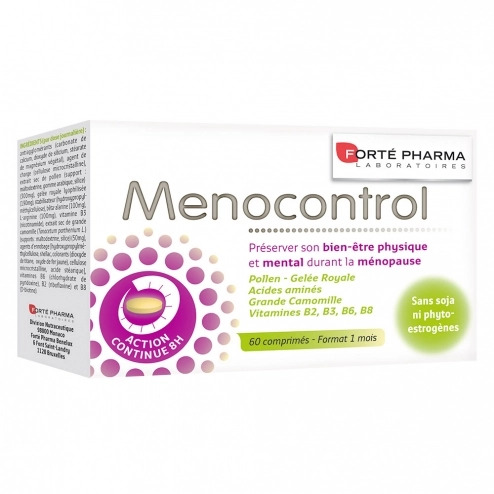 Specially formulated by the Research and Development Department of Laboratoires Fort� Pharma, Menocontrol accompanies you to pass more serenely the course of the menopause. Menocontrol offers you a targeted and adapted solution. Menocontrol sustained-release tablets allow for continuous release of active ingredients for 8 hours, for optimal day and night management. � Pollen helps reduce the sensation of hot flashes / night sweats. Vitamin B6 complements this action by helping to regulate hormonal activity. � Feverfew promotes physical and mental well-being and relaxation. Group B vitamins contribute, as they, has normal psychological functions. � Amino acids (beta-alanine and anginine) and royal jelly complete this formula. Take 1 tablet in the morning and 1 tablet in the evening with a glass of water. Format 1 month to renew. Ingredients: anti-agglomerants (calcium carbonate, silicon dioxide, vegetable magnesium stearate), molding agent (microcrystalline cellulose), dry pollen extract (support: maltodextrin, gum arabic, silica) (300mg), freeze-dried royal jelly (190mg) , stabilizer (hydroxypropyl-methylcellulose), beta-alanine (100mg), L-arginine (100mg), vitamin B3 (nicotinamide), dry extract of feverfew (Tanacetum parthenium L.) (supports: maltodextrin, silica) (50mg) , coating agents [hydroxypropylmethylcellulose, shellac, dyes (titanium dioxide, yellow iron oxide), microcrystalline cellulose, stearic acid], vitamin B6 (pyridoxine hydrochloride), B2 (riboflavin) and B8 (D-biotin) .